Do Rabbits Make great Pets for Children? 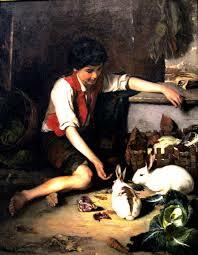 It is often said that rabbits are great pets for children. They are soft, friendly, are good fun and easy to maintain, so of course they are a really popular choice for children who are looking for a pet to look after. There are much more trickier pets out there and so a rabbit seems a good choice. This is quite true, but what is also true is that children do need to supervised around rabbits. Rabbits are not greatly needy pets, but do require a good deal of care in terms of how and when they are fed, maintained and how they are handled. It is a lot to ask a young child to do even if they promise that they will look after them without a problem. To buy a rabbit for a young child to look after unsupervised is really not a good idea to do. We originally bought our rabbit for our children to enjoy but I am the main person who looks after the rabbit. However, there have been occasions where children have the maturity and responsibility to look after a rabbit and do so with great care and attention. So how do you know if your child is ready to take on the responsibility of a rabbit? Here are some useful things that you should consider. 1. Will they remember to feed the rabbit on a daily basis unprompted? 2. Will they feed the correct food and ensure their water and hay is topped up? 3. When they pick them up, will they handled in the correct way which considers the rabbits comfort? 4. Will they remember to clean out the hutch on a weekly basis without prompting. 5. Will they spend time with the rabbit and give it attention without being prompted? It is hard to consider these things but if your child really wants a rabbit then it worth saying that you should definitely be ready to be the main person responsible for the upkeep and care of the rabbit if the child’s interest dies. There are so many Rabbits which are bought for children and after a while are neglected and discarded once they have been lost interest in. This is why it is really worth considering whether a rabbit is the right pet for your child and whether it will get the care and attention that it needs on an ongoing basis. So rabbits do make great pets for children, but only if you as an adult are prepared to supervise and care for the rabbit, unless your child is ready to do so on there own on an ongoing and consistent basis.